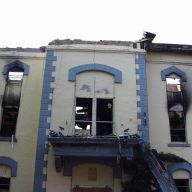 Stabilization of fire damaged historical courthouse and roof structure replacement. Interior design to 90% complete. Finish restoration performed by others.